We bought tinapa (smoked fish) from the Newlands Asian store. Well, we also have smoked fish (salmon, to be specific) from the supermarket which we also like but the one from the Asian store is galunggong (mackerel scad), imported from the Philippines and so that made it special. We had tinapa and monggo last Friday, and it was indeed a yummy dinner. Friday is customarily a veggies and fish day for most Filipinos as we - at least in one meal for the day - skip meat to commemorate Good Friday. 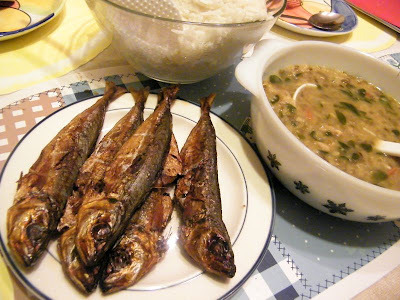 Ginisang monggo and fish are indeed very popular menu items. Kain na! I seldom leave comments on blogs, but you really impress me, also I have a few questions like to ask, what's your contact details? Hi Johnson. What sort of questions do you have? Spinach leaves... will try that next time! Thanks!